Tag line: "One of the greatest love stories of all time... brought to the screen in throbbing glory by a wonderful cast of stars!" The last time I was in England I paid a visit to the cathedral in Peterborough (aka The Cathedral Church of St Peter, St Paul and St Andrew), a structure that dates back to the 12th century. Among the highlights of my tour was a roped-off section with a sign that read “Former burial place of Mary Queen of Scots”. After being executed by England’s Queen Elizabeth I in February of 1587, Mary’s body was laid to rest in the cathedral (her request to be buried in France was denied by Elizabeth), where she remained until 1612, when her son, King James I, had her exhumed and moved to Westminster Abbey (as fate would have it, she was interred directly across from Elizabeth). Having led a tumultuous life, It seems poor Mary Stuart couldn’t even find peace in death. Her brief reign as the Queen of Scotland was, to put it mildly, quite chaotic, and in John Ford’s 1936 film Mary of Scotland, we get an idea of just how turbulent it really was. 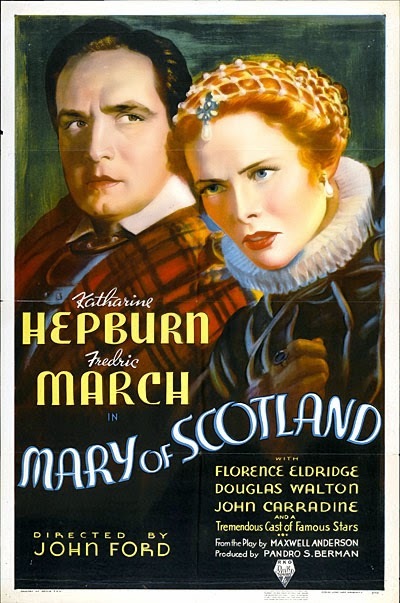 When her husband, the King of France, dies, Mary Stuart (Katherine Hepburn) returns to her native Scotland to serve as its Queen, a move that angers both her half-brother Moray (Ian Keith), who, for years, had been the country’s regent; and her cousin Elizabeth I (Florence Eldridge), who realizes Mary’s claim to the throne of England is stronger than her own. But as Mary soon discovers, being Queen of Scotland is no easy task. Within hours of her arrival, she’s forced to deal with the country’s nobleman, many of whom aren’t happy that she’s a Catholic Queen in what’s become a protestant nation. In fact, the only two people Mary can truly trust are her Italian secretary Rizzio (John Carradine); and Lord Bothwell (Fredric March), a Scottish military commander with whom she’s fallen in love. Alas, a Queen’s heart is seldom her own, and after being pressured by her advisers, she agrees to marry her cousin Lord Darnley (Douglas Walton), even though she has no feelings for him whatsoever. Trapped in a loveless marriage and hounded by John Knox (Moroni Olsen), the leader of Scotland’s Protestant Reformation, Mary sometimes feels as if she’s a prisoner in her own country. Unfortunately, this is just the beginning for Mary Stuart, whose brief reign will prove to be one of the most controversial, and most tragic, in British history. Katherine Hepburn delivers a heartbreaking performance as Mary, a woman who, despite her best efforts, was unable to secure the support of Scotland’s most powerful men (her initial meeting with John Knox doesn’t go well). A sharp contrast to Hepburn’s kindly but naïve Mary, Florence Eldridge’s Elizabeth is a strong-willed woman, and Ford continually underlines the differences between the two, showing, in no uncertain terms, why Elizabeth was the better Queen (time and again, Mary falls into the traps laid by her enemies, most of which stem from her feelings for Bothwell. As for Elizabeth, she regularly rebuffs the advances of her suitors, sacrificing love for what she deems “the greater good”). It’s clear early on that Mary doesn’t have the strength of spirit to govern her people, a strength that Elizabeth exhibits in each and every scene she appears in. Though occasionally a bit too melodramatic, Mary of Scotland is nonetheless an effective period film, thanks in large part to its depiction of two of history’s most famous women. Over the course of the movie, we can’t help but like Hepburn’s Mary, who simply wanted to experience love. Yet by the same token we fear Eldridge’s Elizabeth, and as Mary of Scotland shows us, fear is often a more powerful ally than love when it comes to ruling a nation. Example of your talent. How many films have you seen up to now?